Sweet roasted red peppers marinated in garlic, onions, oregano, thyme, and balsamic vinegar. Roasted red peppers are one of my favourite foods and every fall I roast up a large basket of them and put them in the freezer for use throughout the year. Normally I just use them as ingredients in other recipes but it is always fun to dress them up a bit and enjoy them as an appetizer. I like to marinate them in a balsamic marinade that includes olive oil, garlic, onion, oregano, thyme, and a touch of pepper. 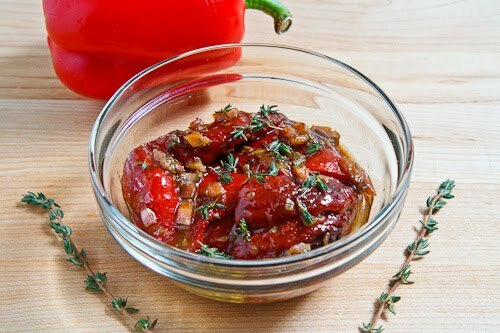 These marinated roasted red peppers are great all by themselves or on a platter with other appetizers and they also make great ingredients or condiments in other dishes like sandwiches. Mix everything and let marinate in the fridge for at least an hour to overnight. Marinated Roasted Red Peppers is a very traditional recipe in Romania, my home country, but we always, always add sugar on them…I'm always disappointed when I buy marinated peppers here because of that; Your salad sounds very flavorful with that combination of spices! Will have to try this. Looove roasted red peppers! I'm loving this idea! Once in a while I make a nice cheese platter up for dinner and am always trying to think of interesting vegetables, etc. to put on it….this will be perfect. I have eaten these out of a jar before but I can imagine they are so much better homemade!